The contradictions come fast and furious in the epochal triple lightning strike that is Beyoncé’s single, video, and globally televised debut performance for “Formation.” The song is slow and furious—I want to put it alongside Kelis’s “Caught Out There,” the most brilliantly abrasive track I’ve heard. Beyoncé hazards three or four different vocal attacks, from direct speech to gloriously full voice. Each has its own register and rhetoric. Repetition condenses around the phrase that would be “C’mon ladies let’s get information” if not for the song’s title. But there is no chorus and no hook, no catharsis and no resolution. No one gets out unscathed. The soundscape (one of the producers is the great Mike Will Made-It) is agitated and rebarbative, the rhythm hypnotically martial: “Formation,” after all. This is to be expected from Beyoncé’s abrupt pivot to our splintered moment, particularly those aspects inflected by Black Lives Matter, which is to say, all of them. 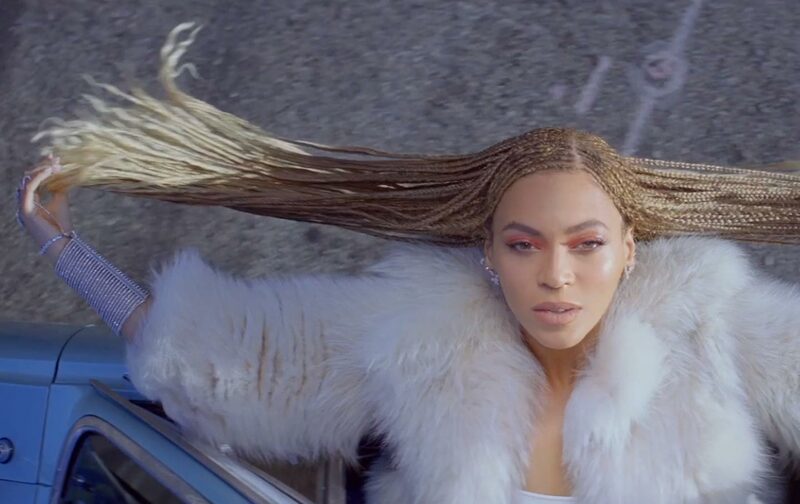 For all the hashtag discourse of #BlackExcellence, “Formation” seems, thrillingly, more like #BlackRage. Beyoncé’s brand has not to this point featured explicitly political position-taking (give or take a stage sign flashing FEMINIST, its meaning convivially generic). The sudden turn has sparked vitriolic criticisms of an artist who in her joyous mastery has seemed not just beloved but bulletproof. Some complaints have issued from reactionary quarters, as in the response of police to the video’s allegorical post-Katrina images of a deluged cop car, or the scrawled text STOP SHOOTING US intercut with a scene evoking Trayvon Martin. Cops regularly perform hurt feelings in response to black artists, and pathetically threaten to abjure providing security at their concerts. The joke’s on them: Their decisions about moonlighting will be based on their ratio of rent to take-home pay, and whether baby needs new shoes. And if they don’t take the gig, someone else will. One could point out that they can no more afford ethics than the rest of us poor saps, if anyone thought cops had ethics in the first place. Other criticisms of Beyoncé resound more loudly. They mostly decry cultural appropriation, an echo of the Miley Twerk Crisis of 2013. In this case, the accusations include appropriating queer and trans culture, images, and vernacular. No less vehement is the cry that the experiences of Katrina are not Beyoncé’s to tell or to market. The reductive category of “identity politics” has never really captured this particular debate; it is more accurately “cultural nationalism,” which insists on a given culture’s possession of experiences and representations that originate within and unify it. Cultural power is offered as emancipatory; in turn, empowerment demands as well the right to profit from what you own. Appropriation is not just trespass, but the latest in a long line of literal theft. These are only some of the clouds forming around “Formation.” Others have noted the mismatch between openly antistate and anti-white-supremacy images and those eulogizing hyperwealth. Add the celebration of a seemingly authentic blackness neither elite nor homogenized—signaled by the extolling of Michael Jackson’s original physiognomy and Beyoncé’s “Texas bama” genealogy—and you have a rigorously insoluble puzzle. The song is at war with itself. How are we to sit with this: to hate the structural violence and racism of the world before us, while rejoicing at the vast rewards given to another by that same world? None of us are idiots; we know that billionaires of any color presuppose millions in poverty, and that a star’s ascent bears no relation to class mobility in general. Still, no contemporary performer has more successfully come to represent the aspirations of a following, of a social grouping that knows itself through its agreement on Beyoncé’s fearless genius and the casual hauteur with which she owns it. “Formation” is a great song. Beyoncé is a great artist. But to glory in the song’s vision, one must also believe her success is that of the culture from which she arises, which she is at pains to name in her genealogy. To believe there is something broadly redeemable about “a black Bill Gates in the making” is to depend on the same cultural nationalism that takes the song as intolerable trespass. Even this is not the heart of the contradiction. When Beyoncé and her troupe debuted the song for global millions in February, the chosen costume paid homage to the Black Panther Party for Self-Defense. It’s not that Beyoncé isn’t a revolutionary (about which: no kidding). It’s still worth noting that “the most dangerous threat to the internal security of the country,” according to J. Edgar Hoover, was in its time absolutely hostile to the politics of cultural nationalism: The Panthers’ confrontation with the cultural-nationalist US Organization, heightened and exploited by the FBI, would climax in a fatal shootout. Panther minister of education George Murray noted, “The police fear brothers and sisters who wear naturals, but the natural is not a gun.” It is not for me to imagine what the Panthers might have made of a black Bill Gates, or the dream of same. It is also not for me to say: Look, a contradiction! Rather, we might say the song is also about contradiction. About how the leap from black rage to racialized revolutionary politics for our moment is still on its way—sometimes blocked, often fissured and fractious and furious; how it feels serrated and inchoate, going in five different directions at once, trying this, trying that. But it is on its way. And how we all know this, and how that must be terrifying in some quarters.